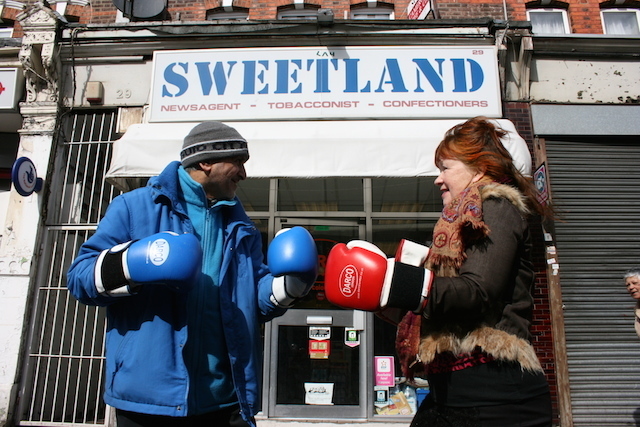 Rose with newsagent Danny — who also sells the boxing gloves his family in Pakistan makes. Harlesden — it’s not somewhere you'd normally think about when considering a safari. But then, there's nothing normal about Rose Rouse and she's not on a normal 'safari'. A former journalist for iconic 80s music magazine The Face, she's been pelted with bread rolls by Frankie Goes To Hollywood for giving them a bad review, got into scraps with comedy duo French And Saunders, and got off on the bad foot with The Stranglers. She's also the author of a delightful blog, the best bits of which have now been collected and are being published as a book, A London Safari — Walking Adventures in NW10. If you've never read about her exploits in this somewhat-maligned part of London, Rose explores her locale on foot, encountering — or taking with her — some of its diverse residents. Rose talks like the clappers. Despite professing to be exhausted, her energy fizzes as she rails against the way journalism has changed since her first forays into the trade: “There used to be this combative spirit when we sat down with a star — it wasn’t this nice, ‘no-difficult-questions’ PR-led exercise,” she says. It's what inspired her to start the blog. She wanted to revive that spirit — in her own way. Since the first steps of her Harlesden ‘safari’, she's pounded the pavement with documentary-maker Louis Theroux, comedian Alexei Sayle, UK reggae scene pioneer Locksley Gichie, as well shop owners, railway enthusiasts, community campaigners and a host of the wonderful and colourful characters from this often-ignored corner of the borough of Brent. With UK reggae scene pioneer Locksley Gichie of The Cimarons. While other writers such as Will Self and Ian Sinclair walk and write with great knowledge about the areas they’re in, Rose freely admits to “walking with ignorance and wonder”. It’s a charming trait which comes across in her writing: open, almost childlike in its innocence and sense of curiosity, and she's unafraid to ask awkward questions (she makes a point of taking many people she walks with into her local lingerie shop, just to provoke a reaction). It certainly seems to work: her interviewees respond to her lack of inhibitions with candour. One of her favourite walks is the one with George Mpanga — AKA George The Poet. The 23-year-old was brought up on the St Raphael’s Estate — which was one of the roughest estates in the area — but defied the odds to secure a place at Cambridge University, from where he has gone on to become a renowned spoken-word artist. “I told him I had never been to St Raphael's Estate, so he agreed to take me,” she remembers. “It’s an estate with a lot of problems, and there was a a lot of stabbings and shootings when he was growing up there. It really affected him. One of her more celebrity-oriented outings came about after discovering that comedian and writer Alexei Sayle took a regular afternoon walk. So she contacted him and invited him to join her for a change. Along a walk and talk encompassing architecture, Communism and whether there's anywhere to get a decent coffee in Harlesden, Rose indulges her desire for some combative journalism. She takes Sayle to the lingerie shop. “He was utterly disinterested,” she recalls, but did get a much stronger response when walking with self-styled “tantric goddess”, Kavida Rai, who delighted in the detour. It's not the only risqué experience she had with Rai. In the three years since she started the blog, Rose has really warmed to the area. “I’ve learned a lot about Harlesden," she says. "My relationship with it has changed. For example, now when I walk past the Paddy Power, I also know it used to be a cinema, but it also used to be a nightclub called The 32 Club, which is where music promoter [and founder of the Mean Fiddler group] Vince Power told me he met his first wife there, when he was 18." A traditional safari usually means you leave with a camera full of snaps and a head full of animals. Rose's adventures have left her with a head full of snapshots of other people's memories. It may not seem as exotic, but it's a richer experience of a very particular type of animal. A London Safari — Walking Adventures In NW10 by Rose Rouse is published on 30 October.